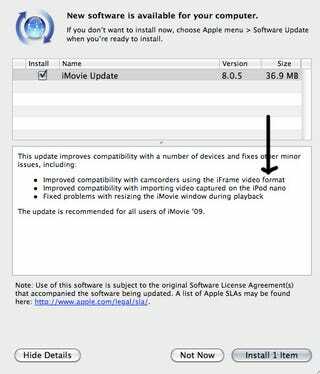 The most interesting about the iMovie update that dropped yesterday is that "improves compatibility" with camcorders using the iFrame video format. The iFrame video format, you say? Why yes, it's a new video format from Apple. iFrame's based on industry-standard codecs H.264 and AAC, but it's got a standard res of 960x540 and it's designed by Apple "to speed up importing and editing by keeping the content in its native recorded format while editing."